Greetings! 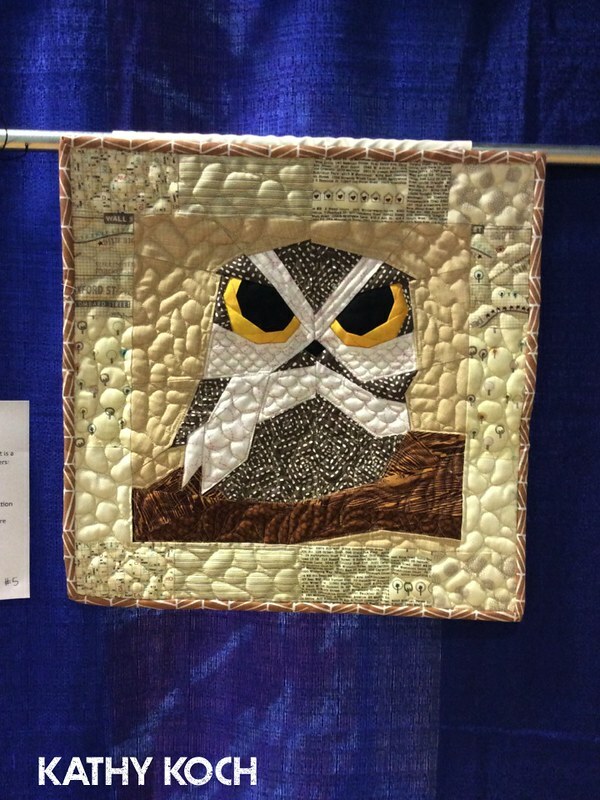 Please find below a snapshot album of our recent quilt show. There is no simple, singular, agreed-upon answer to this question. For me, a modern quilt is one that matches a particular aesthetic. There is probably some expanded negative space, heavy use of solids, something simple/minimal/stark about it. And these quilts can be from any time. I have seen many vintage quilts that have the modern aesthetic. 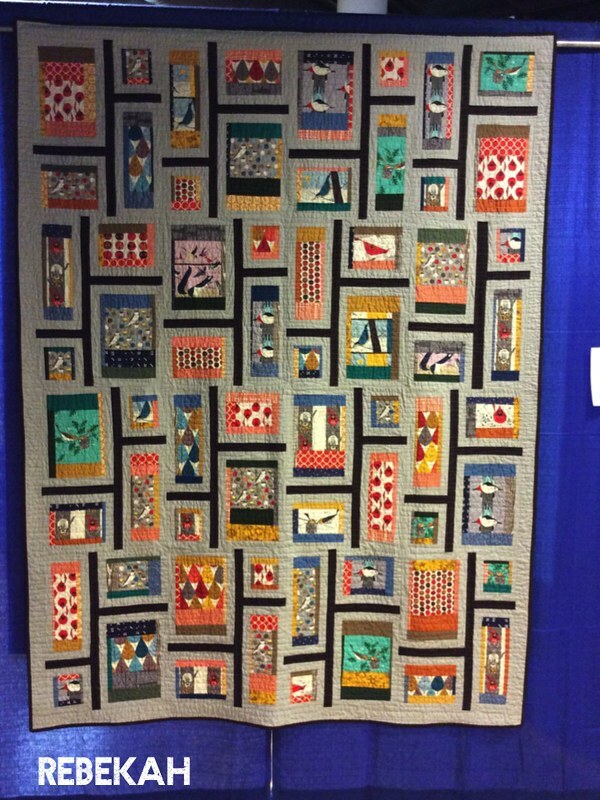 Utility quilts from decades past look just like the improv quilts so many modern quilters produce today. 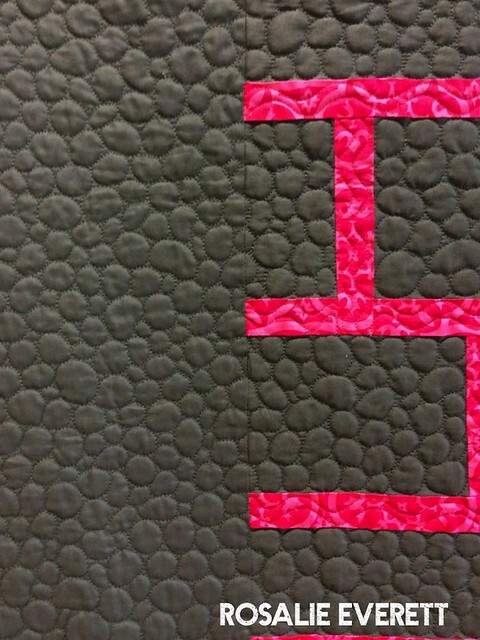 For others, modern quilting is less about the actual quilts and more about the people making them--people who came together online before they came together in person, people who are all about making things for themselves, to suit themselves, without worrying overmuch about rules and labels and aesthetic categories. For these folks, modern quilting is a movement, it's a community, it's a trend within the general renaissance of the handmade, it's something that seems new and yet traditional. Blossoming and rooted. This exhibit is of quilts made by members of the Ann Arbor Modern Quilt Guild. We're a group that started meeting in 2011 with a few women sitting around a table at the library. Slowly, we've grown, with new people arriving all the time (you are welcome to join us). We meet to share our projects and our skills and our enthusiasm. And we were asked to exhibit some of our members' work at this show. We tried to select quilts that illustrate some of the aesthetic trends in modern quilts, but you will also see quilts that represent the movement more than a particular aesthetic--we've got a couple of collaborative quilts here. And some that show how traditional patterns have been interpreted with a twist or that simply show a particular method or look that has been popular. Quilts were juried into the show by a volunteer committee from the Ann Arbor Modern Quilt Guild. And here are the photos of the exhibit! Due to limited space and time, these photos are far from perfect, but I think you'll understand the beauty of each quilt. The ordering of the quilts is not meaningful, it simply corresponds to the quilt frame originally assigned to each quilt by the jury and so it is the order that all of our notes are in! Based on a similar design by Cheryl Arkison, I made a gray fraction quilt for my cousin as he graduated from high school. The popularity of that quilt online led to requests for a pattern. Thus, with Cheryl’s permission, I wrote a pattern and made the Curried Fraction Quilt. 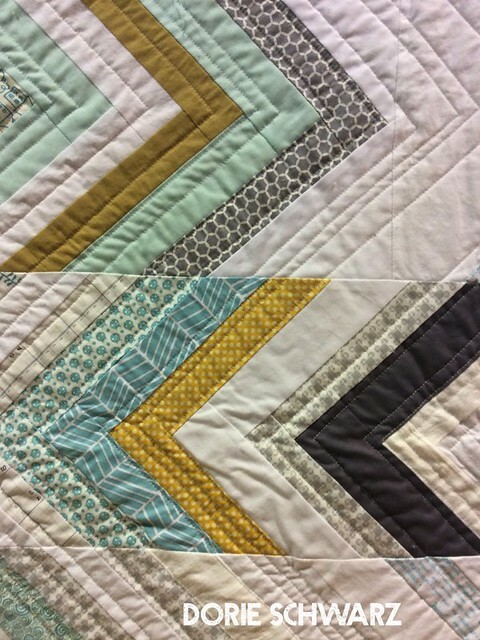 Both fraction quilts and a pattern for making your own appear in Quilting with a Modern Slant by Rachel May (2014). 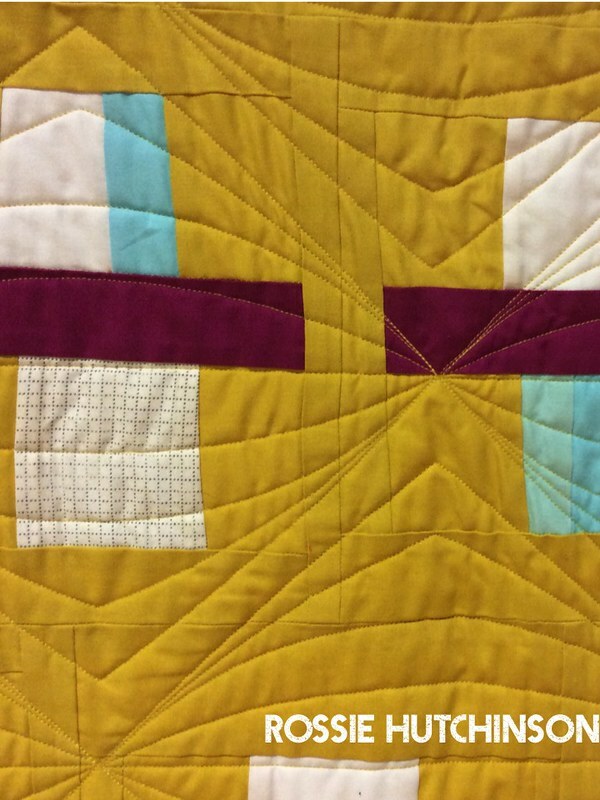 This quilt was chosen by the Ann Arbor Modern Quilt Guild because of its disappearing grid structure, its use of solids, and its improvisational piecing. Rossie blogs at www.r0ssie.blogspot.com and is on Instagram at r0ssie_fmq. 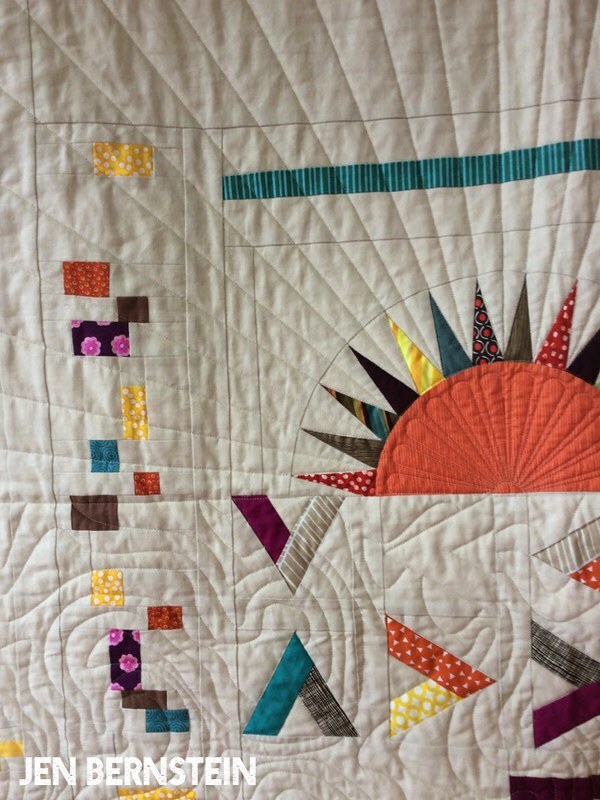 Her pattern for this improvisational quilt can be found in Quilting with a Modern Slant by Rachel May (2014). This quilt was made by Pam as part of a challenge within the guild. 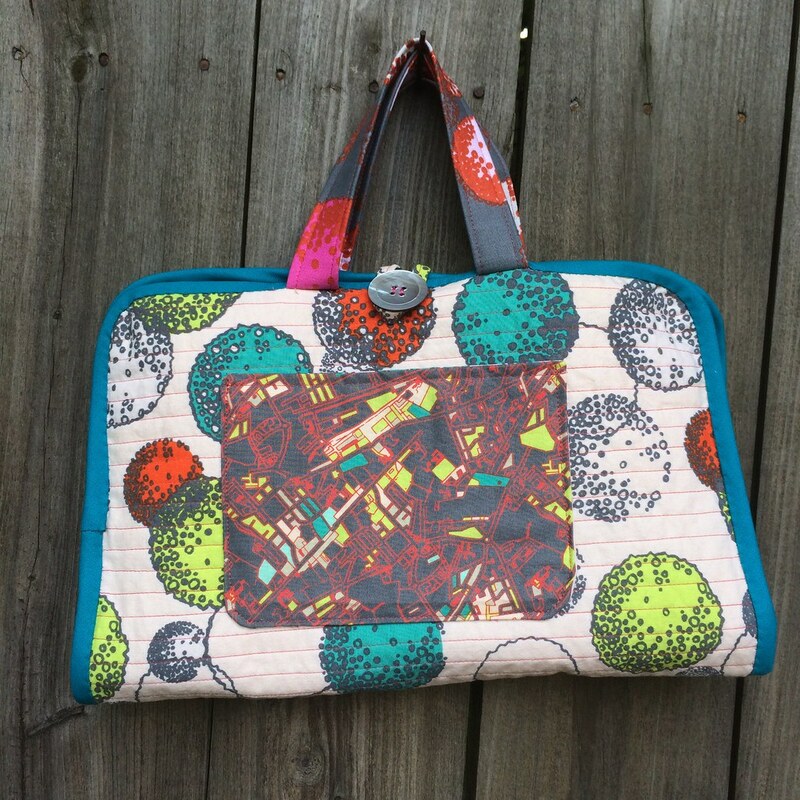 Pam used the "Modern Pickle Relish" pattern by Modern Quilt Relish. 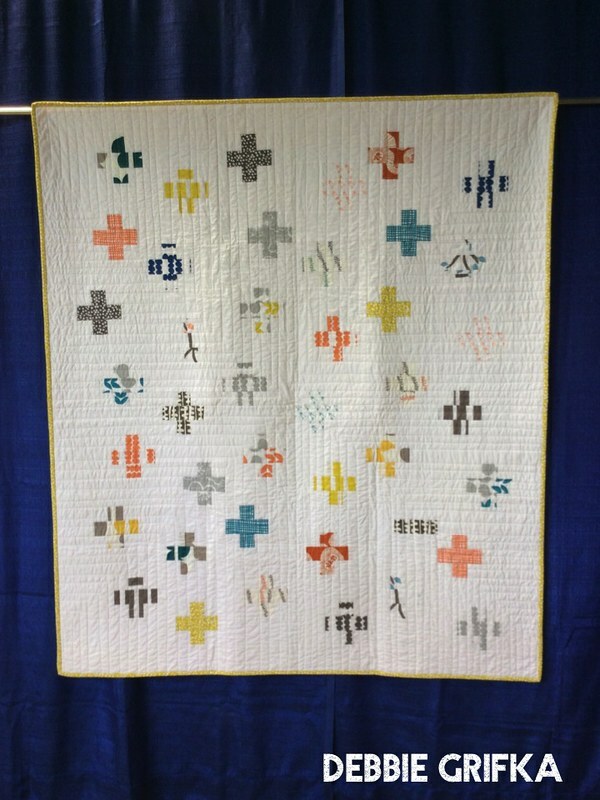 This quilt was chosen by the Ann Arbor Modern Quilt Guild because of its use of negative space and solids. 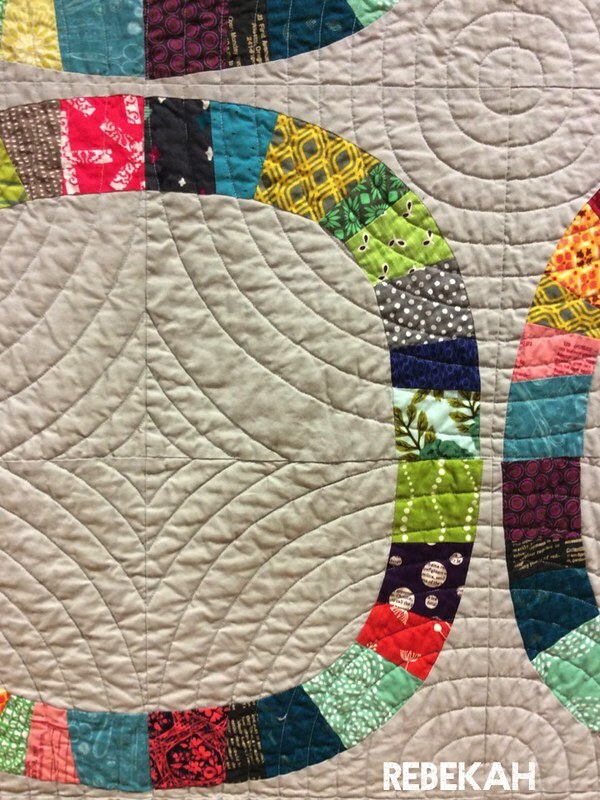 The dense and varied free-motion quilting is typical of many modern quilts. Pam served as the tireless chair of our committee for this exhibit. You can follow Pam on Instagram as pamyjam. I saw this pattern on Jacquie Gering’s blog and just knew I had to make it. I loved the fabric showcased and the simplicity of the design—a perfect first quilt for my new RV. 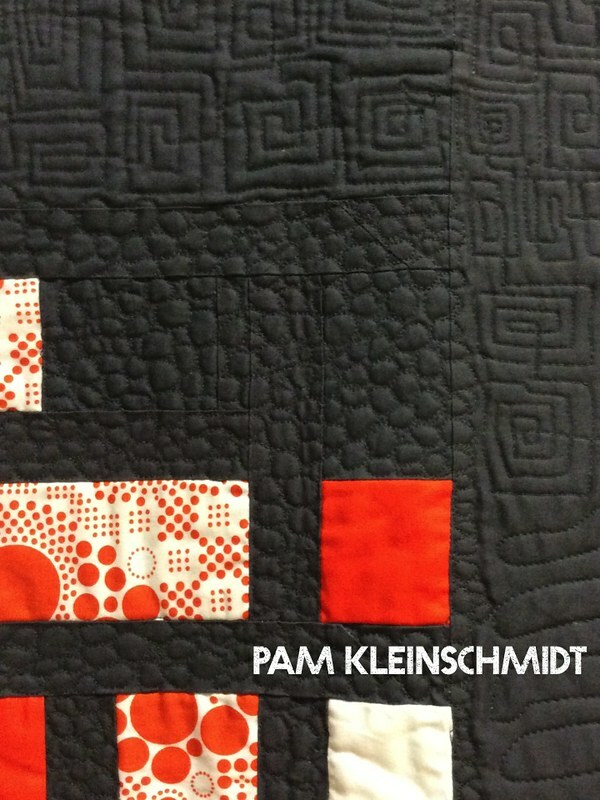 This quilt was chosen by the Ann Arbor Modern Quilt Guild because of its simplicity and asymmetry. Kathy is a professional long-armer (you'll see her listed as the quilter for many of our quilts!) You can find her online at www.threadbearquilting, or www.facebook.com/ThreadBearQuilting, and she is on Instagram as librkat. Looking for a mid-century feel, I made this quilt by adapting Elizabeth Hartman's Rapid City pattern. I fussy cut the fabric to feature the bird and squirrel prints from Charley Harper and improvisationally pieced around them. 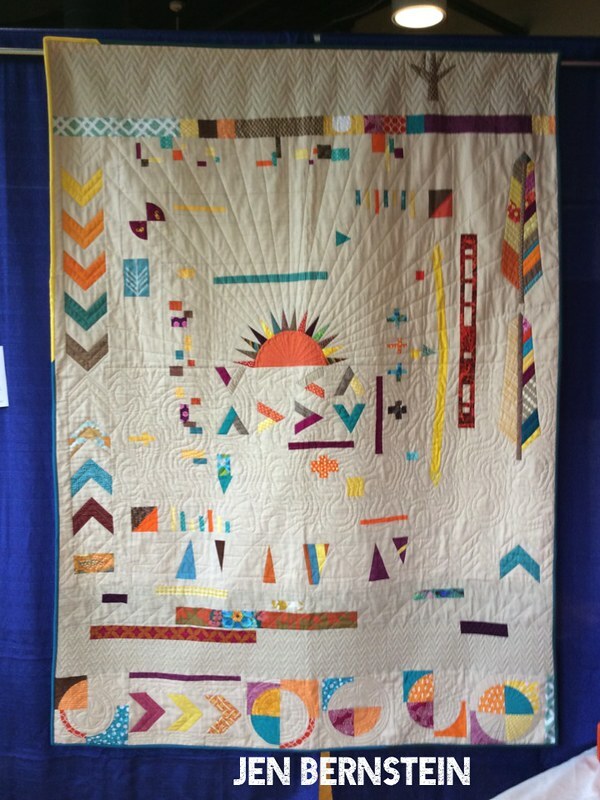 This quilt was chosen by the Ann Arbor Modern Quilt Guild because it is improvisational, mid-century inspired, and has an unconventional layout. Rebekah is a long-time blogger, you can find her at Don't Call Me Becky. On Instagram she's rebekah725 and her flickr account is jrcraft. I made this little owl for my daughter. It is a pattern from one of my favorite designers: Shape Moth. 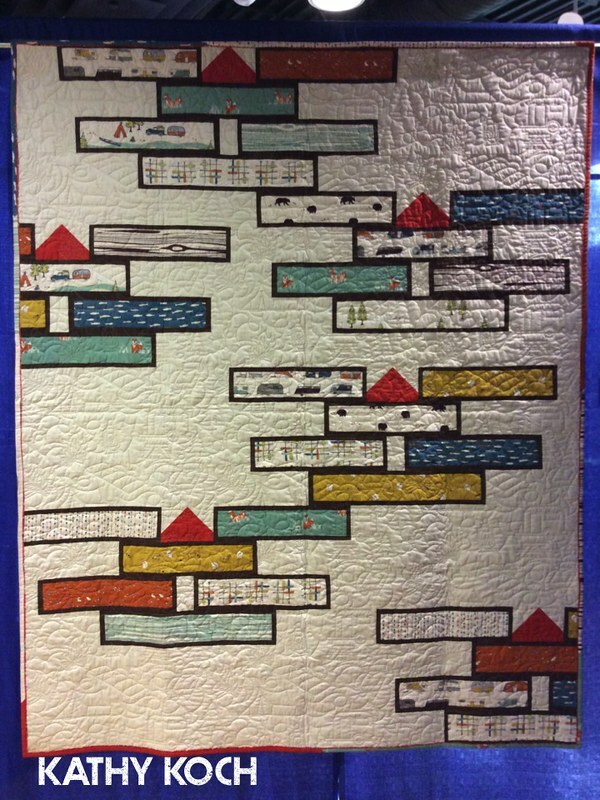 This quilt was chosen by the Ann Arbor Modern Quilt Guild because it is paper pieced—a technique that is gaining traction amongst modern quilters. The mixed neutral prints used in the background are typical of many modern quilts. (I already told you this, but...) Kathy is a professional long-armer (you'll see her listed as the quilter for many of our quilts!) You can find her online at www.threadbearquilting, or www.facebook.com/ThreadBearQuilting, and she is on Instagram as librkat. Rather than line these blocks up into a perfect grid, it was more interesting to turn them around and break them up. The result reminds me of a broken chain link fence. The pattern is my own — Chain Link by Esch House Quilts. 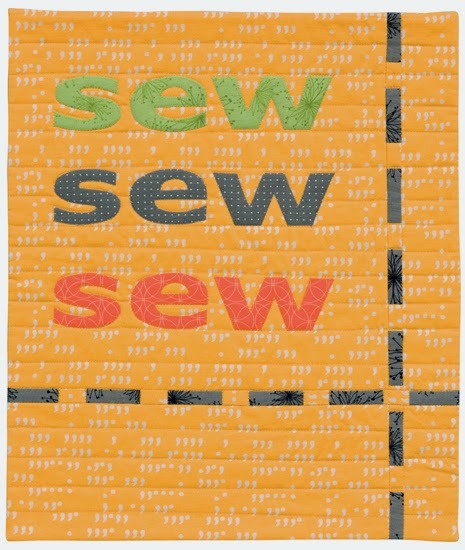 This quilt was chosen by the Ann Arbor Modern Quilt Guild because of its use of alternative grid work. 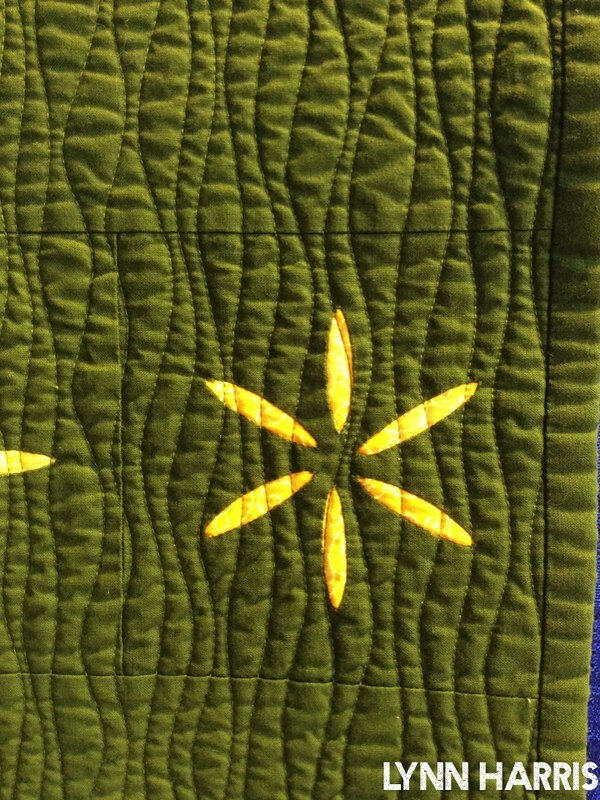 It is a good example of appliqué being used in a modern quilt. Debbie is a professional quilt designer and a blogger. 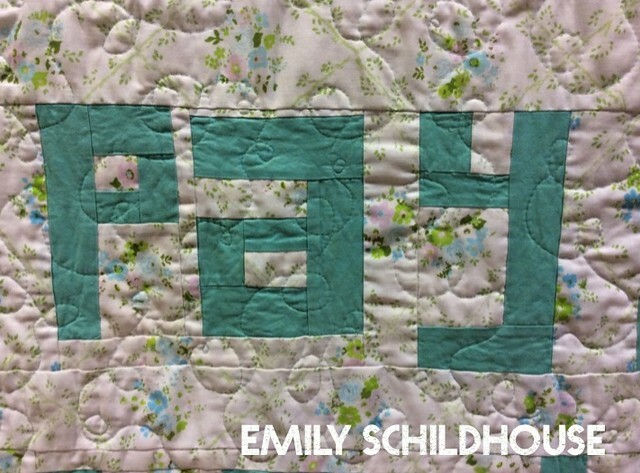 You can follow her blog Esch House Quilts and she's eschhousequilts on Instagram. 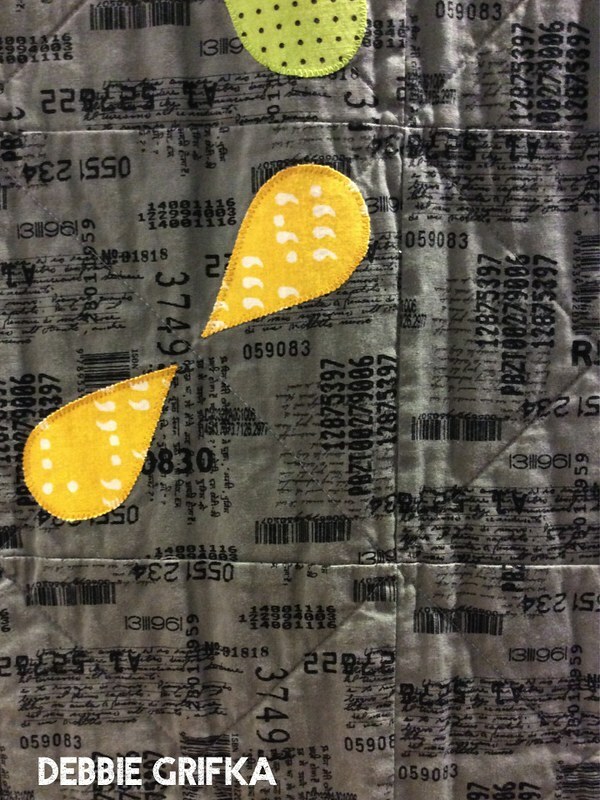 You can buy Debbie's pattern for this quilt here: Chain Link by Esch House Quilts. 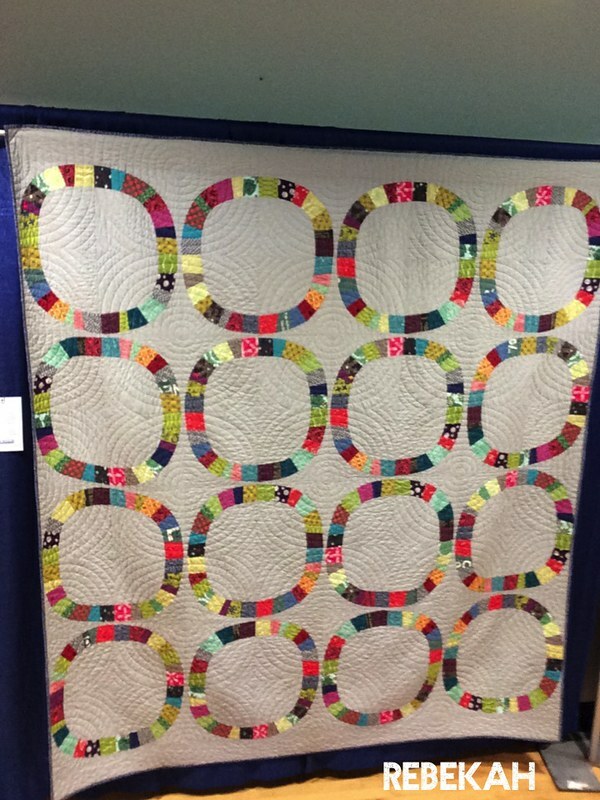 This quilt was made as part of the round robin bee at the Ann Arbor Modern Quilt Guild. Each month a different guild member took home the quilt and added to it. This quilt was made for and inspired by Jennifer Bernstein. Jennifer choose Essex yarn dyed linen in sand as the background fabric and specified the color scheme for the patchwork to reflect the feeling of late summer days. 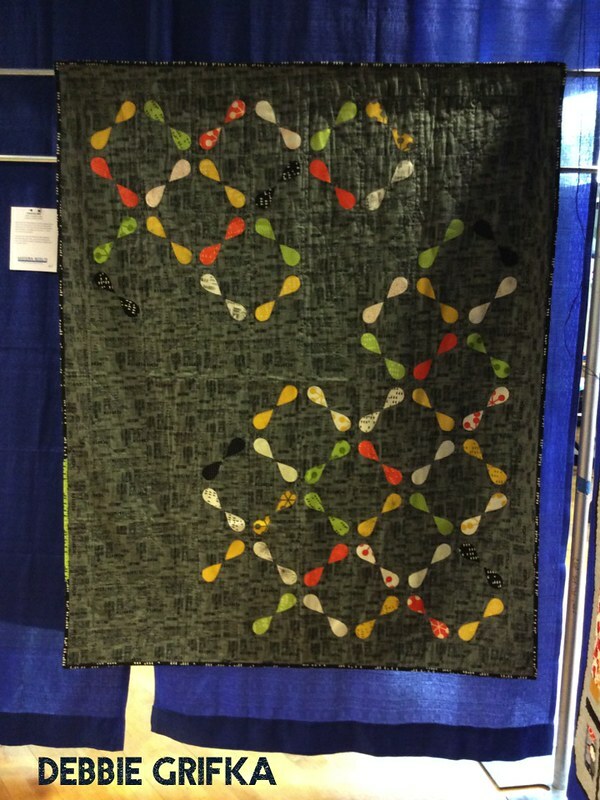 This quilt was chosen by the Ann Arbor Modern Quilt Guild because it is improvisational and contains a lot of negative space. We also wanted to showcase the collaboration that is an important part of the modern movement. Jennifer is a lawyer and a quilter who blogs at Brave Little Chicken and she's bravelilchicken on Instagram. 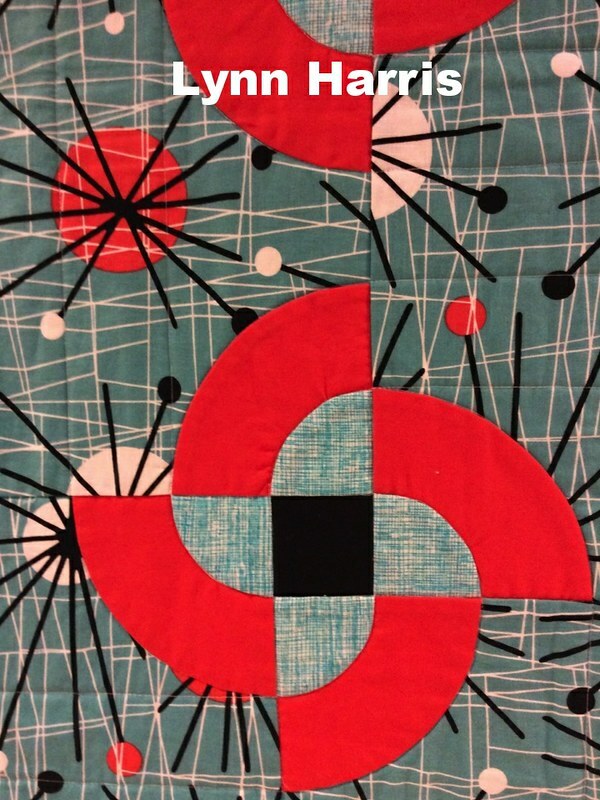 I made this quilt as part of an online quilt bee--The Mid Mod Quilt Bee, a group of quilters that use mid-century modernism as a touchstone as they create quilts together. I drew up a design, dyed a bunch of red and orange fabric, pieced a sample row, posted pictures, mailed out fabric, and then the members of the bee each pieced a row for me and mailed it back. 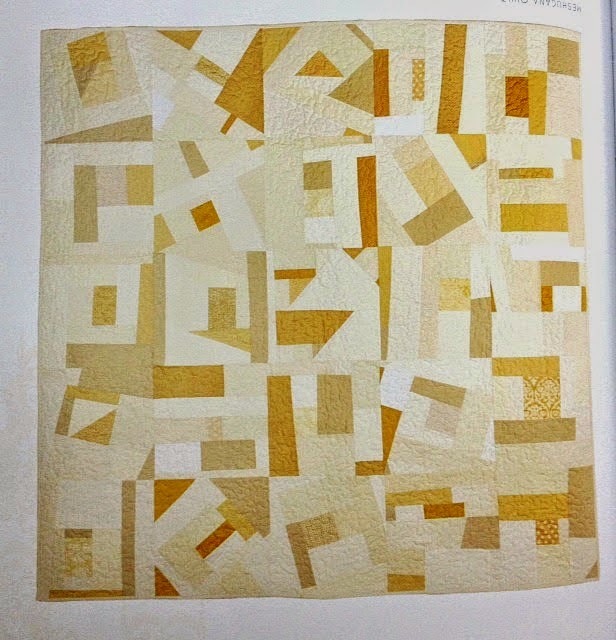 This quilt was chosen by the Ann Arbor Modern Quilt Guild because of its use of solids and minimalist design. It also showcases the collaboration that is an important part of the modern movement. 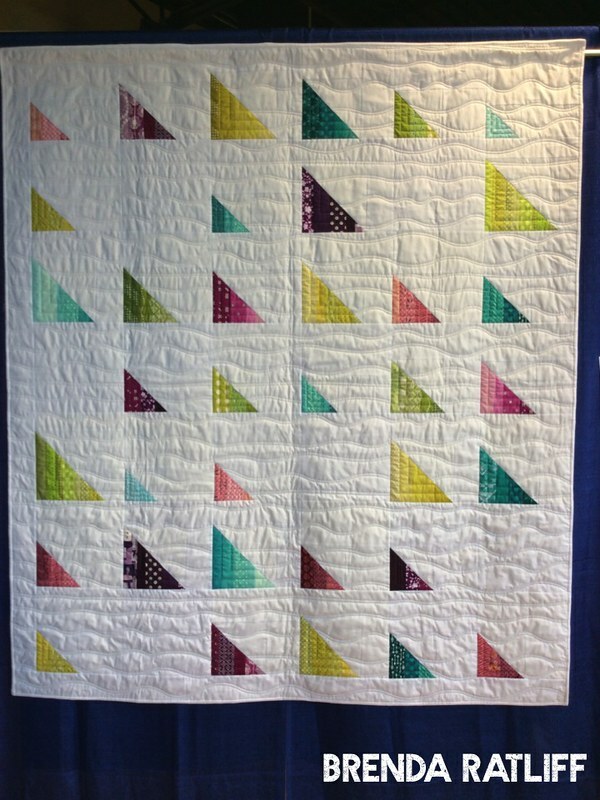 You kind find a tutorial for making a quilt like this on Rossie's blog: Kelp Quilt Tutorial. (I already told you this, but...) Rossie blogs at www.r0ssie.blogspot.com and is on Instagram as r0ssie_fmq. 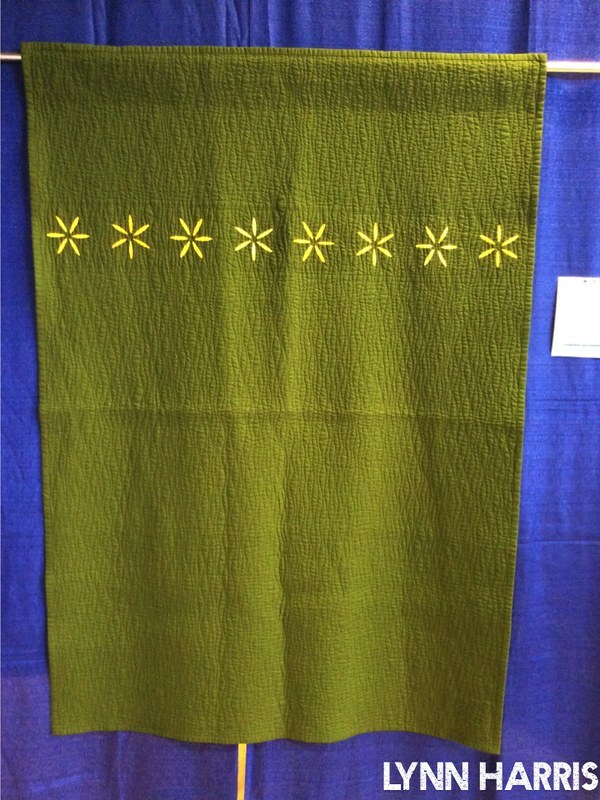 This quilt was chosen by the Ann Arbor Modern Quilt Guild because of its use of solids and expansive negative space. 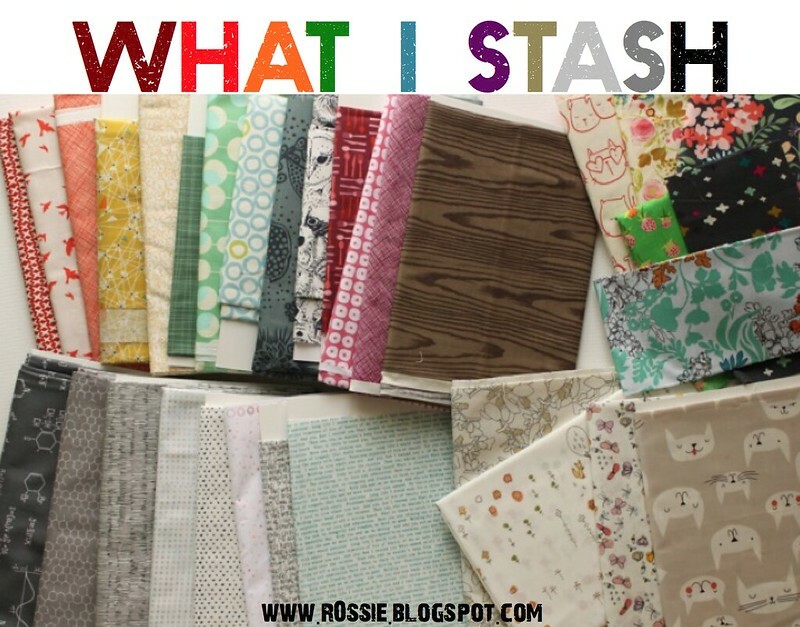 Rosalie isn't using a blog or Instagram, so if you want to see more of her work, you'll just have to come to a guild meeting and chat with her! I purchased this Denyse Schmidt pattern in 2008 and spent 5 years staring at it and mustering up the courage to make my own version. This pattern is an updated version of the Double Wedding Ring Quilt-- which makes it a modern twist on a traditional pattern. This quilt was chosen by the Ann Arbor Modern Quilt Guild because it was made using a pattern that has become absolutely iconic for modern quilters. (I already told you this, but...) Rebekah is a long-time blogger, you can find her at Don't Call Me Becky. On Instagram she's rebekah725 and her flickr account is jrcraft. Atomic Pinwheels was inspired by an old tile design. I was interested in the challenge of piecing the interlocking rectangles and squares that allow the pinwheels to spin in opposite directions and I loved being able to show off large pieces of this large scale retro fabric! 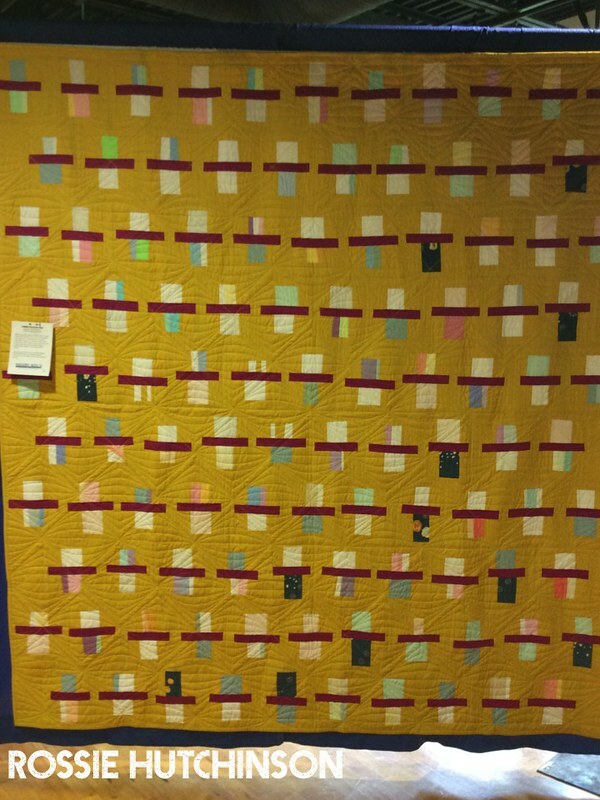 This quilt was chosen by the Ann Arbor Modern Quilt Guild because of its use of bold colors and graphic print. 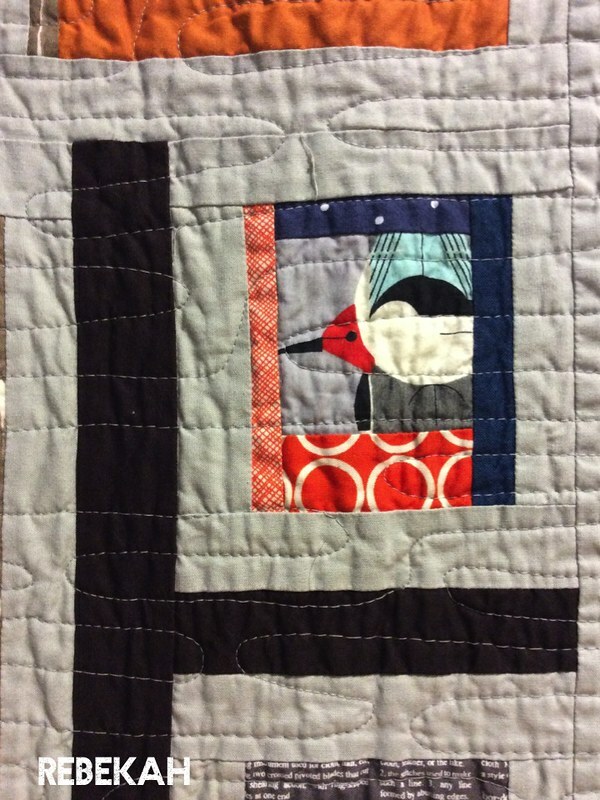 Lynn is a blogger, quilt designer, and professional long-arm quilter. You can follow Lynn on her blog, The Little Red Hen and on Instagram at thelittleredhen_lh. 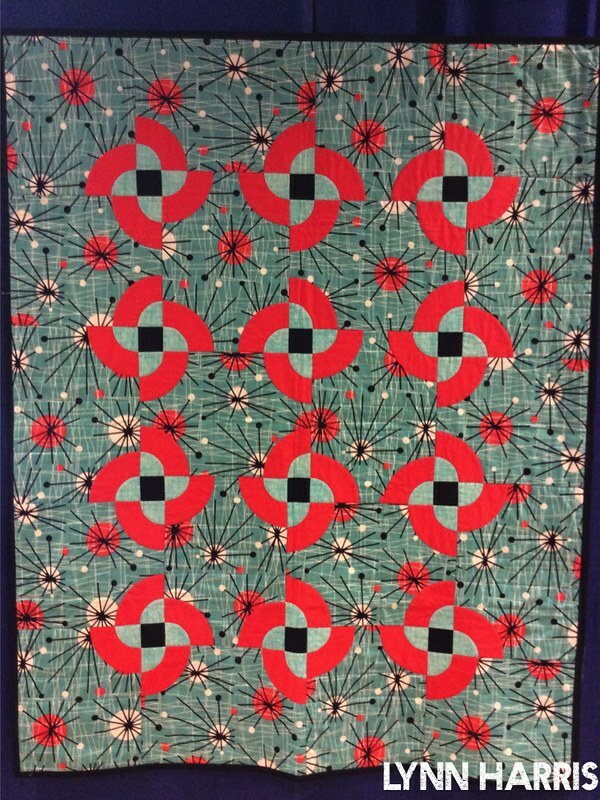 You can buy Lynn's pattern for this quilt here: Atomic Pinwheels Quilt Pattern. I made this quilt following the “Twisted” pattern by Carolina Patchwork. This quilt is a gift and my fabric choices were influenced by a desire to match the modern, cool lifestyle of its intended owners. 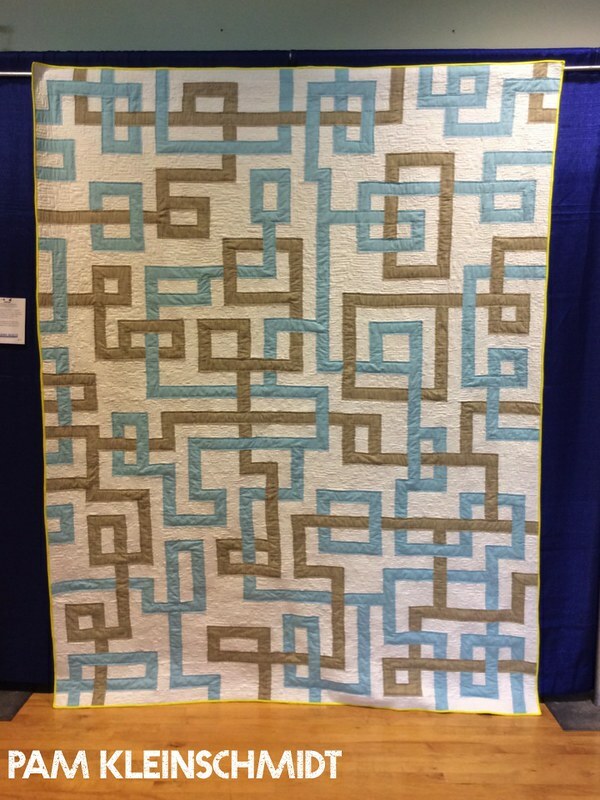 This quilt was chosen by the Ann Arbor Modern Quilt Guild because of its use of alternate gridwork and highly geometric look. (I already told you this, but...) Pam served as the tireless chair of our committee for this exhibit. You can follow Pam on Instagram as pamyjam. 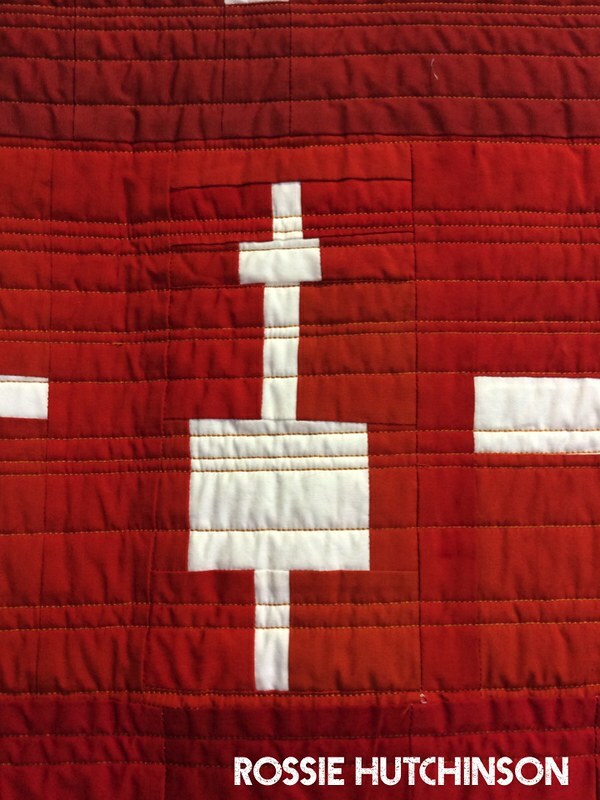 I saw this reverse appliqué block in an antique red and white quilt. I wanted to try it out! My son influenced my color choices and childhood memories shaped the placement of the blocks. 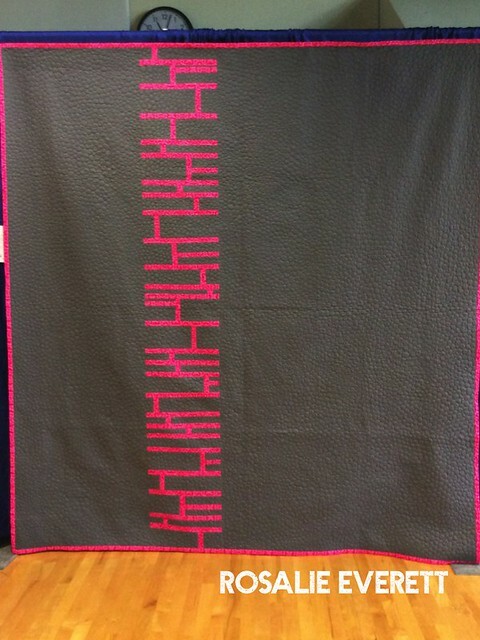 This quilt was chosen by the Ann Arbor Modern Quilt Guild because of its use of minimalism and expansive negative space. 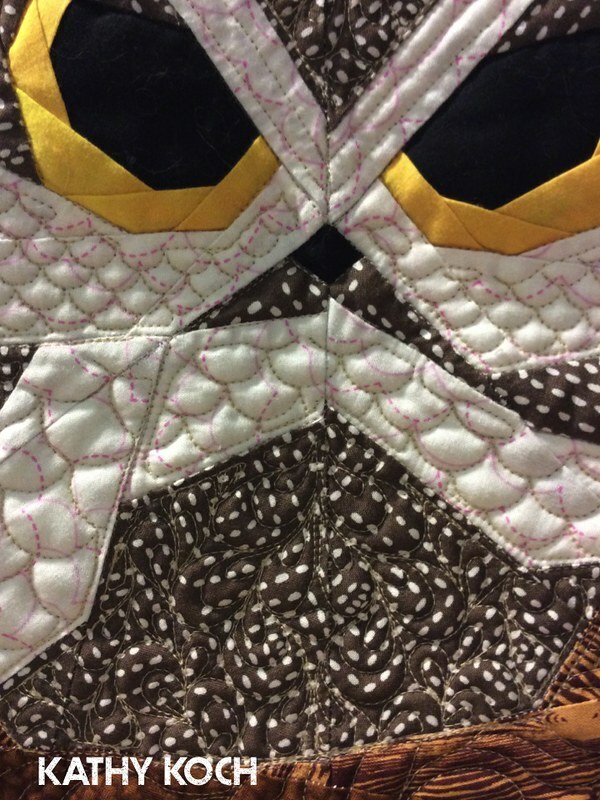 It is a good example of reverse appliqué being used in a modern quilt. You can see far better images of this quilt in Minimal Quiltmaking by Gwen Marston and buy Lynn's pattern for this quilt here: Daisy Chain Pattern (I already told you this, but...) Lynn is a blogger, quilt designer, and professional long-arm quilter. You can follow Lynn on her blog, The Little Red Hen and on Instagram at thelittleredhen_lh. This quilt is the July 2015 pattern for the national Modern Quilt Guild. It features alternate grid layout and negative space to create a modern take on a half square triangle. 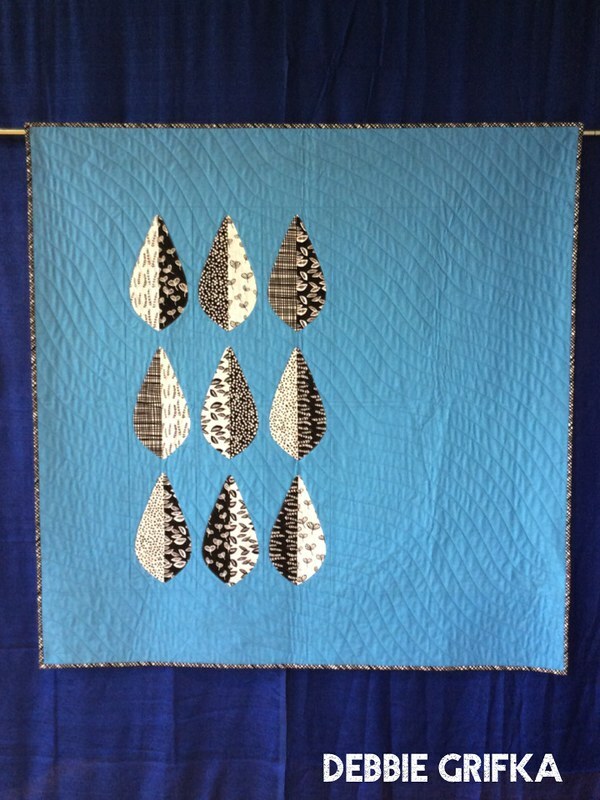 This quilt was chosen by the Ann Arbor Modern Quilt Guild because it is improvisational, uses solids, and contains a lot of negative space. Just a Bit Frayed. The pattern for this quilt will be available to the public at a later date! Simplified leaves have enduring appeal for me, as does a beautiful blue sky. 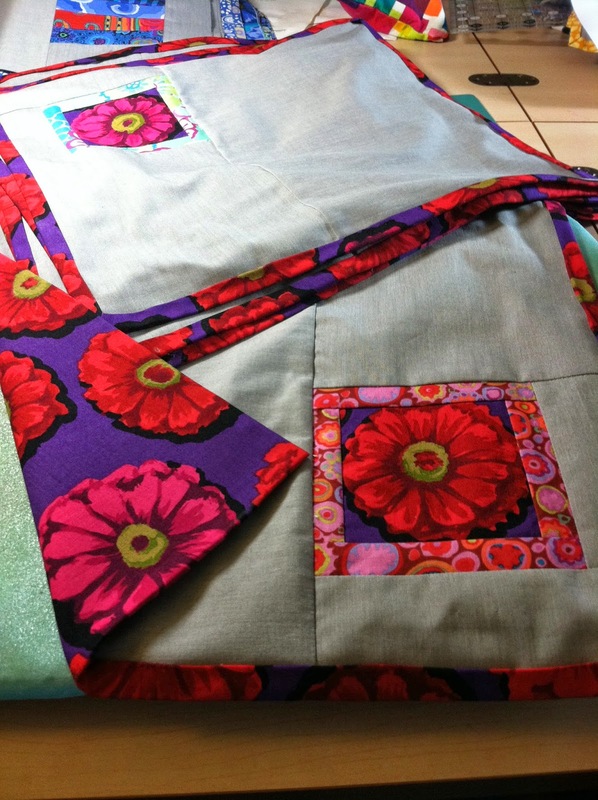 Creating this quilt helped me endure this long winter. I was honored to have my quilt pattern for Zephyr distributed to all of the members of the Modern Quilt Guild in February. 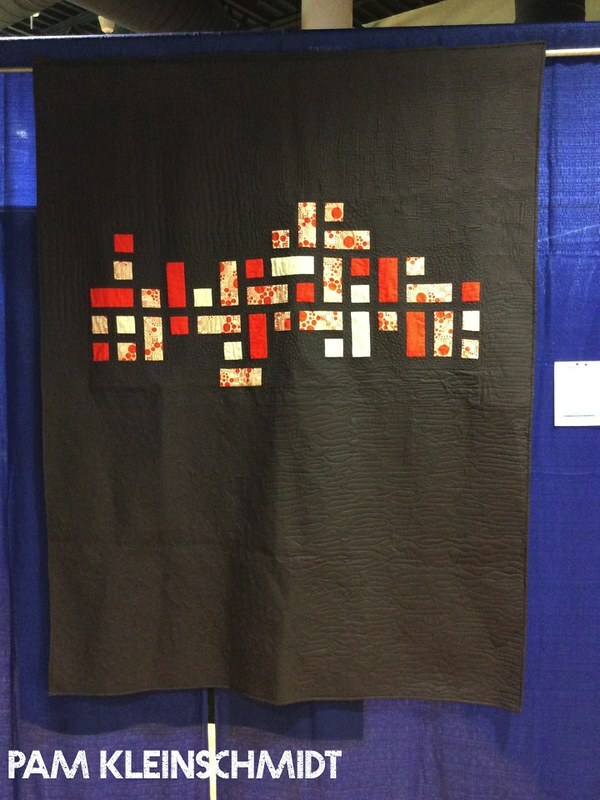 This quilt was chosen by the Ann Arbor Modern Quilt Guild because of its use of negative space and solid fabric. 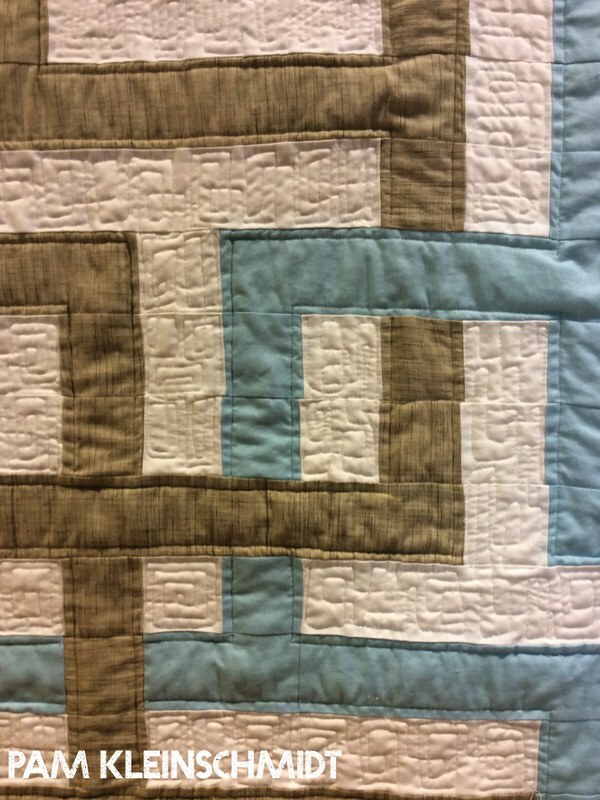 It is a good example of appliqué being used in a modern quilt. (I already told you this, but...) Debbie is a professional quilt designer and a blogger. You can follow her blog Esch House Quilts and she's eschhousequilts on Instagram. I've long admired the work of Yoshiko Jinzenji and the way her background fabrics and blocks sometimes meld. This fabric by Lotta Jansdotter was the perfect opportunity for me to play with this idea. 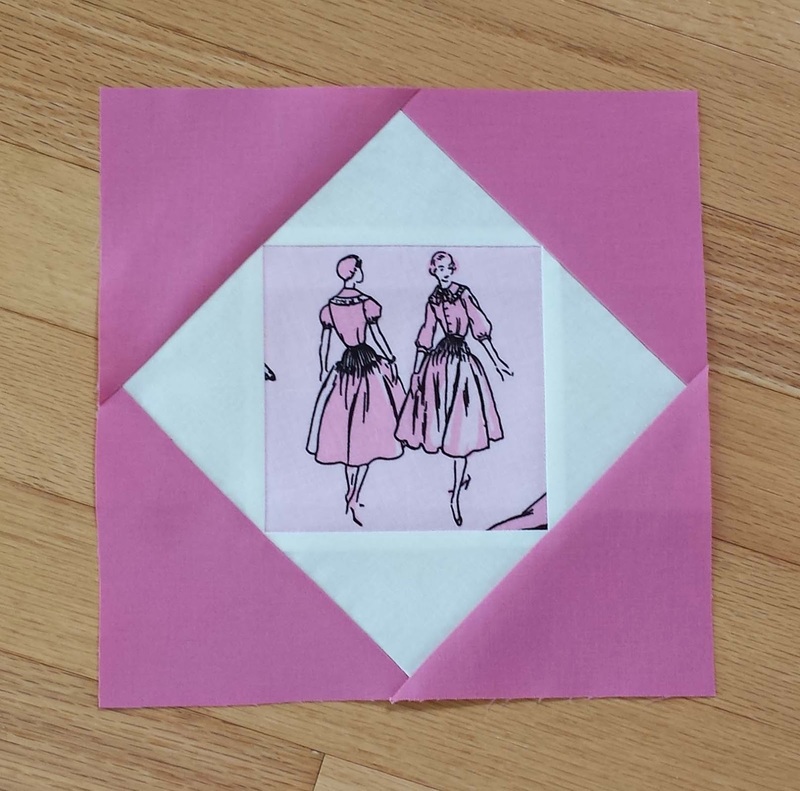 The pattern is my own: Think Positive from Esch House Quilts. 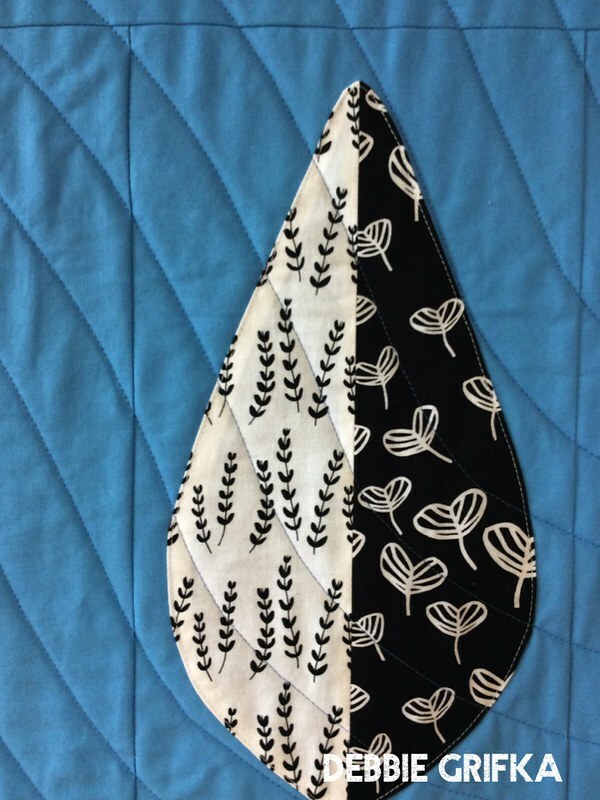 This quilt was chosen by the Ann Arbor Modern Quilt Guild because of its use of negative space and alternative grid work. This is a wedding quilt I made for my sister. I chose a stanza of lyrics from the musical Rent - a favorite of my sister and I, and fitting for a wedding quilt. The piecing technique is from Word Play Quilts by Tonya Ricucci. 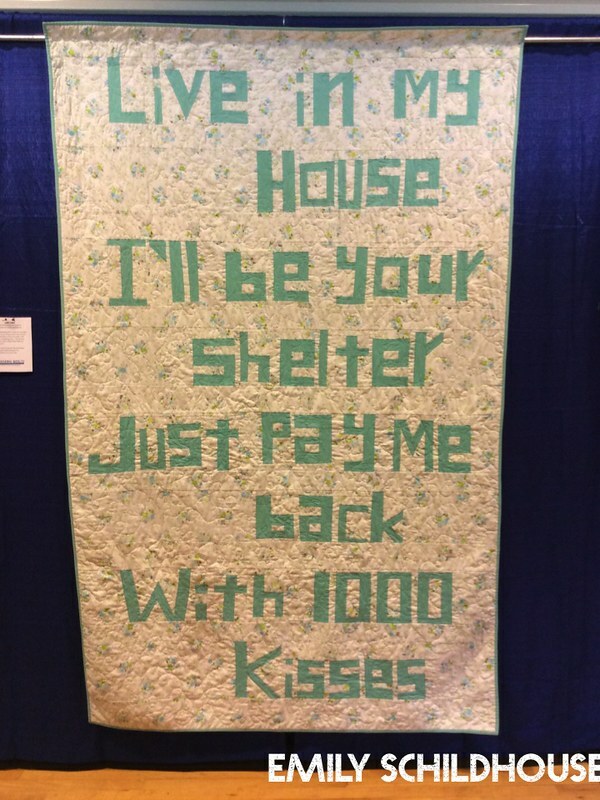 This quilt was chosen by the Ann Arbor Modern Quilt Guild because it is improvisational and uses text. A vintage sheet aficionado, garment sewer, and quilter, Emily spends most of her days parenting her lovely family. You can follow her glitter- and bubble-filled adventures on instagram emmmylizzzy and on her blog emmmylizzzy. 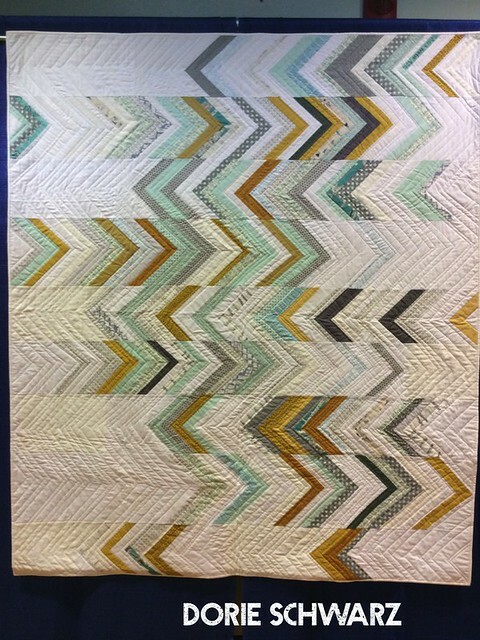 This quilt is an interpretation of a braid or herringbone pattern. It was inspired by the Improv Chevrons tutorial on the blog Six White Horses. 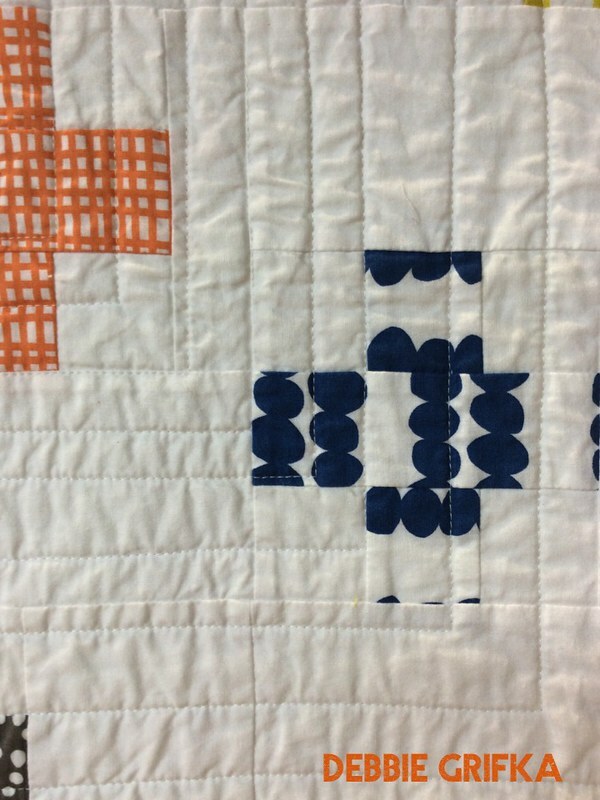 This quilt was chosen by the Ann Arbor Modern Quilt Guild because of its use of improvisational piecing and negative space. The use of white and the limited color palette are typical of many modern quilts. 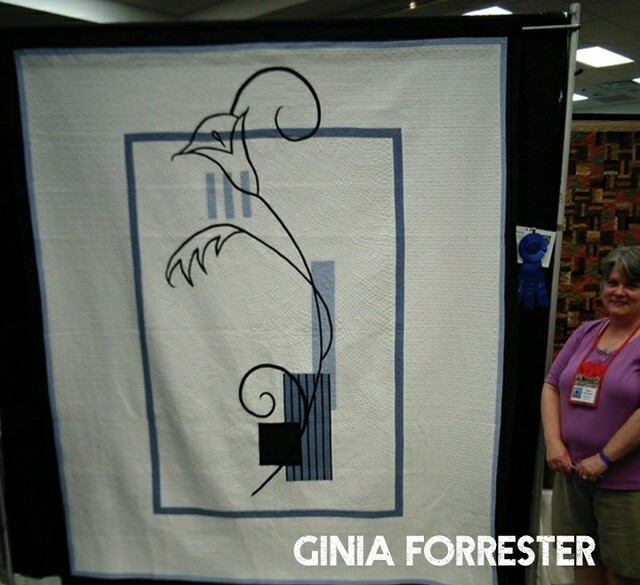 And, this story seems like it would be incomplete without mentioning that A2MQG member and GAAQG President Ginia Forrester won the "viewer's choice" award for her quilt "Modern Lily," which was hanging in the larger show. Here's a picture of Ginia with this beautiful quilt, which she made for her nephew. 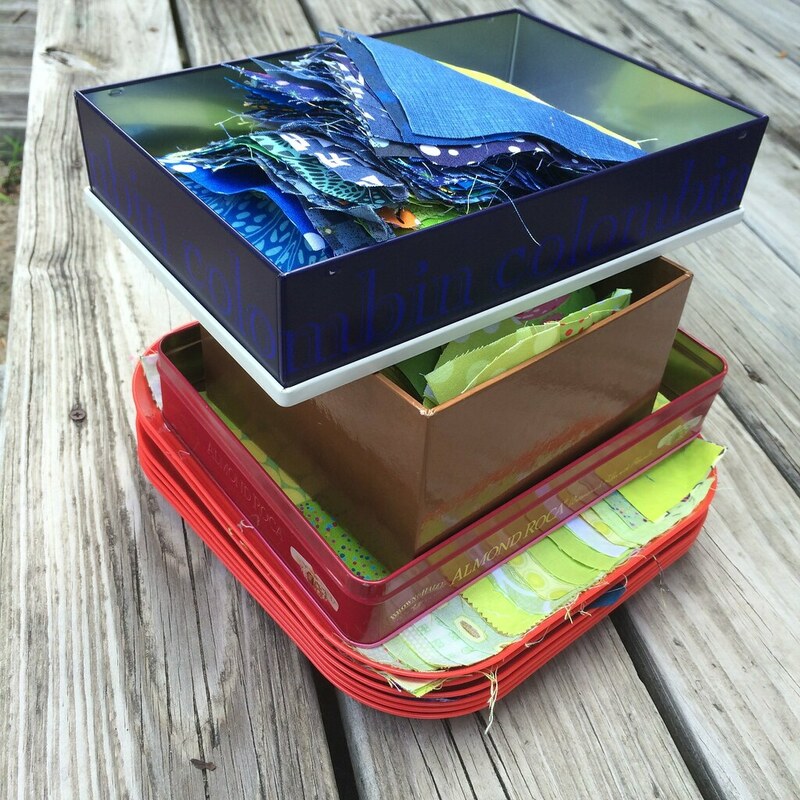 You can find Ginia on her blog Early Morning Quilter and on Instagram as earlymorningquilter. Meeting on Wednesday 8/30! Special guest Andie Johnson! Please remember to RSVP via Pink Castle's website for our meeting this Wednesday! And bring a folding chair if you have one! 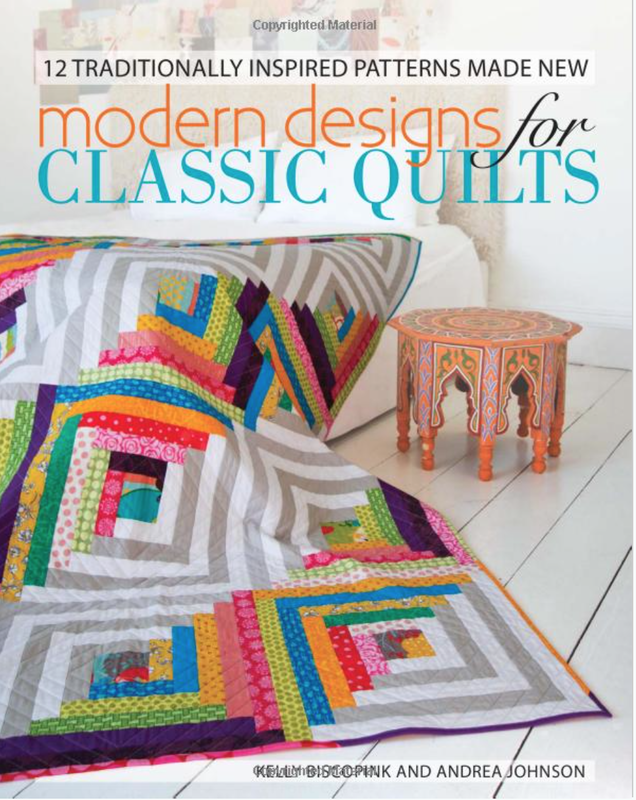 As was announced at the last meeting, Andie Johnson, the modern quilter and co-author of Modern Designs for Classic Quilts will be part of our program, giving an amazing trunk show and sharing all kinds of information about her quilts. Andie is also going to be teaching at Pink Castle on Thursday evening 5:45 - 8:45 and there are still spots remaining in the class! We kept the price low to make it accessible to as many of you as possible...just $50 for three-hours of instruction! 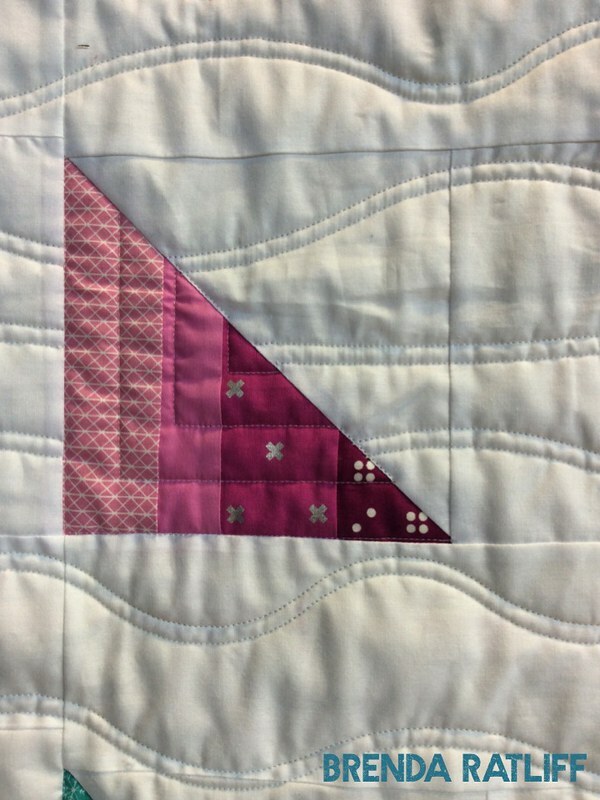 The class is open to members and non-members and the topic is the modern crazy piecing she used to construct her Meshugana Quilt! Click here to sign up! I'm all signed up for this class, foundation piecing onto fabric is a new technique for me! 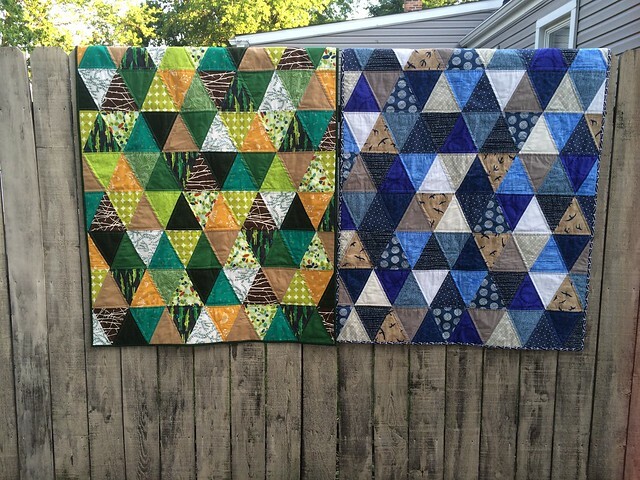 I just need to decide on a color scheme for my quilt. Hmmm. Okay, off to play with fabric and make decisions! Weekly Round Up for 7/27/14! 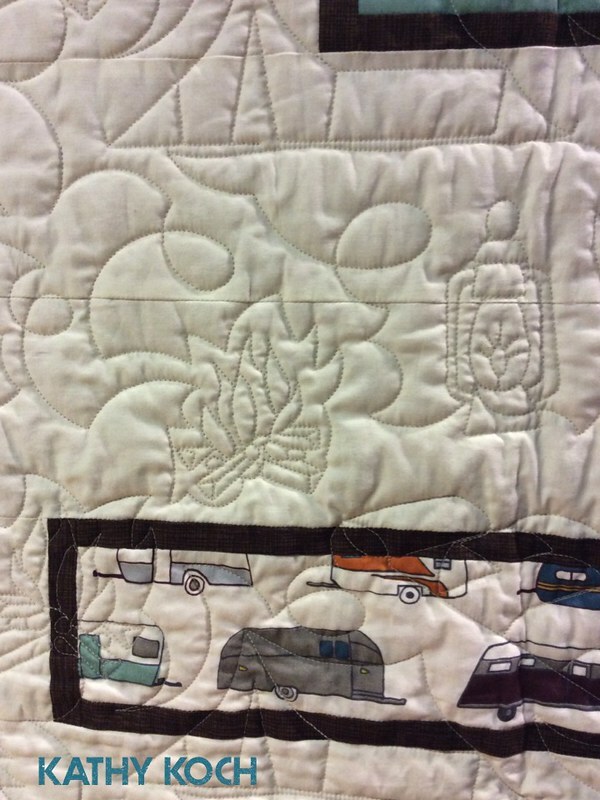 Rebekah also talks about some works in progress and the quilts she has in the quilt show. What a cool way to use up some orphan blocks! Not much of a quilt yet, I'm afraid. 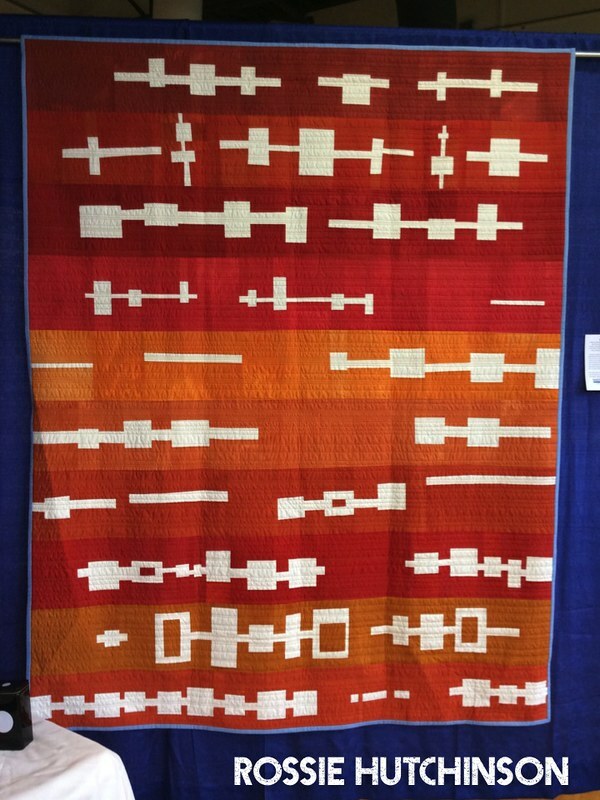 Rossie also has a post on her thoughts on Modern Quilts in conjunction with the special exhibit our guild had at the Greater Ann Arbor Quilt Guild quilt show. And Lynn has been teaching sewing camp! And she's showing the projects her students made on her blog this week. I hope you all made it out to the quilt show this weekend. Remember to reserve your spot at Wednesday's meeting, bring a chair if you have one, and your blocks for the lottery. Weekly Round up for 7/20/14! Weekly Round Up for July 13, 2014! Weekly Round Up for 7/6/14!